It’s Sunday night and the house is empty again. Aidan has returned to school, and our weekend guests have headed south toward Philly. The hush. The still. The simplicity. Tonight, the empty house is a friend. In this spaciousness, I am brought to tears. Not once, but several times, consecutively. 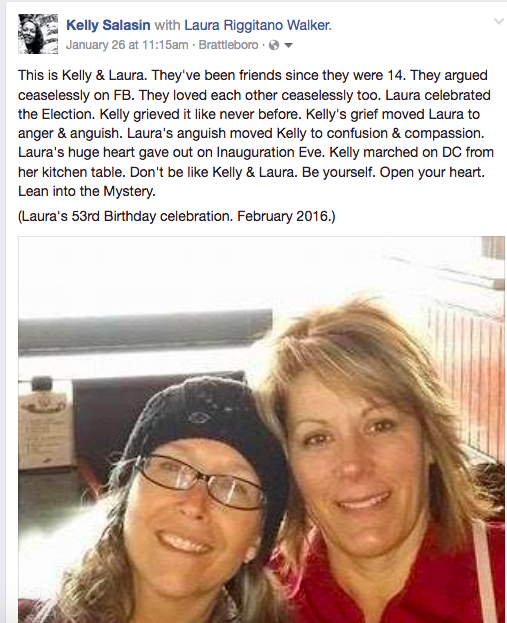 “We buried my friend today,” I want to say, but that’s not true. It was only her ashes we released over the Whetstone Brook because she was drawn toward it when she visited 5 years ago. “I love that creek near your house,” she’d say. “It’s a brook,” I’d tell her. That trip was her first and only one to Vermont, and she came in the winter, and she hates winter, and she was very sick then too. But it was my 50th birthday, and I had planned a women’s weekend, and she wanted to be here, much like she wanted to make it to London during my semester abroad when we were 20. Despite her fragile state (though fragile is never a word that could be used to describe my friend), she traveled alone ahead of her husband and our friends so that she could have an extra day before the festivities. The sky grew dark by the time her train pulled in, and a light snow began to fall. We were wild together once—dancing, laughing, gallivanting—in London, in Philly, at the Jersey shore. Now all her wild was inside. We got together again a couple years after my 50th for a long weekend in Cape May. We celebrated her birthday. She was doing really well that time. She loved the sea. Even in February. No one knew it would be her last. If you’ve followed me on Facebook ahead of the election in 2016, you may have recognized our friendship by our fierce arguments. You may or may not have noticed the ways we “liked” each other’s family photos and celebrated each other’s milestones. You wouldn’t have known that behind the scenes, we checked in on each other’s kids and talked about her treatments and made plans to meet up when we could. Laura talked a lot about making it back to Vermont in the summertime, admiring as she did all the photos I posted of the pond. On the day after the election, I posted an image of myself. It was reminiscent of the photo I knew as a child: the weeping chief looking over the littered land. 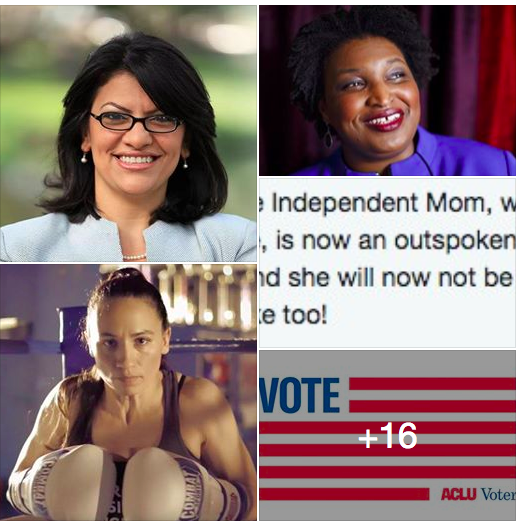 Laura messaged me immediately: “Maybe women will really rise up now,” she said, encouraging me, with deep compassion, even while celebrating her candidate’s shocking victory. I missed the Women’s March. Laura was hospitalized that week, and died on the eve of the inauguration. It’s funny that she’s come to Vermont again just ahead of the mid-terms. Her son Cameron and I talked politics all weekend, doing our part to bend the arc of history toward justice. As we took a pinch of her ashes and let them go over the rushing waters of the Whetstone Brook, it began to snow. Like the flowers & the season & the light & even many loves, everything, including me, passes. And doesn’t that make it hard to breathe? 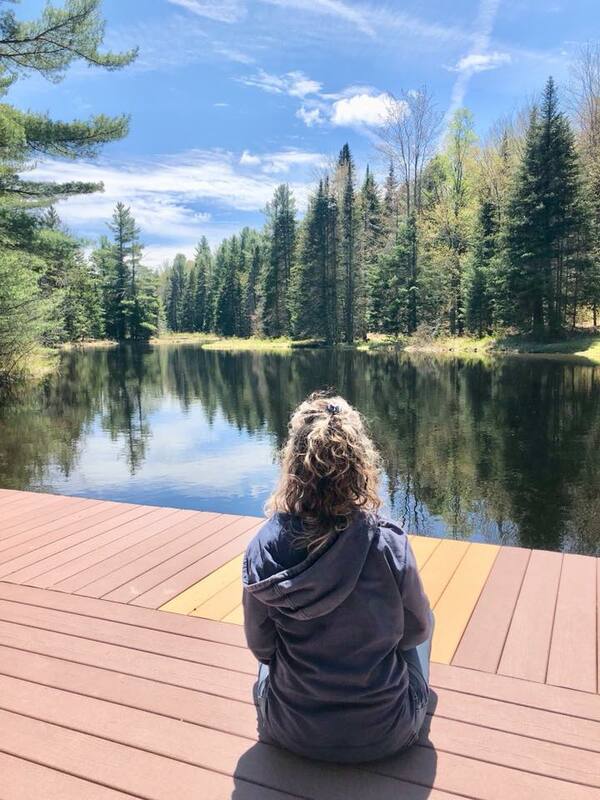 On Wednesdays, I used to say to my children (and myself): “Don’t say, no, go with the flow,” which is perhaps why, in the absence of their presence, I wake on a quiet Wednesday morning to a spontaneous meditation of letting go. Loved ones. Precious times. Personal highs (and lows.) Resentment. Bitterness. Dreams. Teeth. Muscle tone. Heartache. There was a time when if I didn’t hold on tight, it would all be gone. Much like I ask the leaves to do when a strong wind comes too soon. “Hold on!” I say, “Hold on!” not wanting a single leaf to leave before it’s reached its peak; before I’ve had every opportunity to savor its color as if such a thing is due. How did I come upon such entitlement? Is it American? White? Middle class? Does such a subscription simply accompany each incarnation? My stomach clenches at the thought like it did that September morning at the shore when they came to take my mother and carried her out in a bag right past her tomato plants, still ripening on the vine. Didn’t she love her tomatoes. With salt. Don’t I still. 4 remain on my counter, the last of summer’s gifts. And didn’t I feel, after she took her last breath, after we opened the bay window above her dead head–the whoosh of love. The freeing of energy. The opening of the door to heaven, whatever heaven may be. To everything, there is a season, and sometimes the season is too short. Or it could be the leaves barely yellow blowing from the trees, the house once filled now empty of children, my mother gone 18 years, too many days in a row of dark and dreary, and the light, this morning, returning, with a rosy hue, a perfect color–for relinquishing everything. Peaches & blueberries & lima beans: Nana Burrows. Corn on the cob & shell peas: Nana Lila. 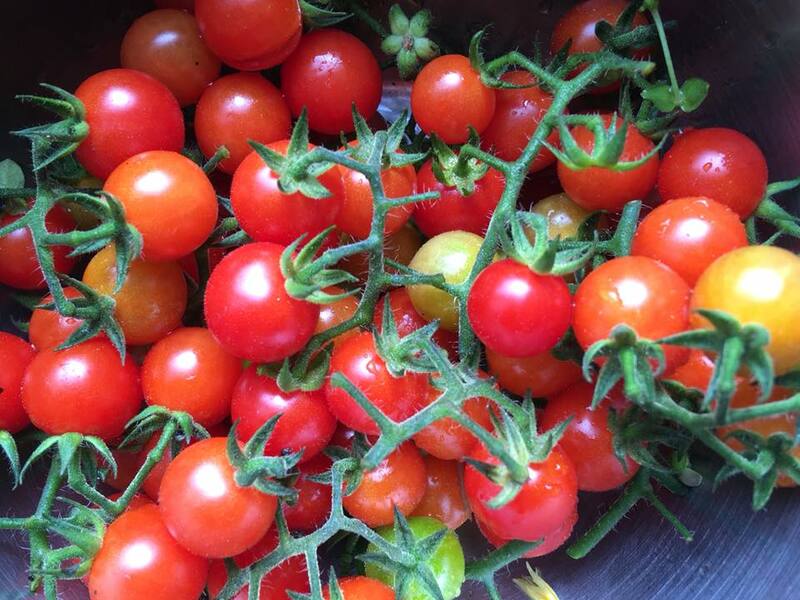 Tomatoes: My mother, my grandmothers, my great-grandmothers, myself. I find us in the garden. At harvest time. And how is it that this matrilineality surprises me there? Have I forgotten Eve? Gaia? Even so, I marvel at the capacity of two days of vague autumn sun to ripen so much on the vine. One must be hopeful to plant a garden and persistent and resilient. Gardening is foolhardy and often stunningly rewarding–body, mind & soul, but especially soul. To be intimate with the soil and the sun, the worms and the birds, the elements and disease is… Everything. It is a holy act, gardening, in the dirt, on one’s knees. A man in the garden is a beautiful thing. A child too. But it is my mother and my grandmother and my great grandmother who I meet there, in the intertwining of the vines while I gather the green beans, reminding me of our lives, our paths, our futures–joined. I harvest for them. I plant for them. I speak for them. I hope–for all of us. I know what it is to have those upon whom you depend be… undependable. When instead of protecting and providing, they lead you into fear and despair and overwhelm. I learned long before my time that collapsing among them was not an option. Not if I wanted a different outcome. Not if I cared about those who were less sufficient than me. This is how I know that turning away and throwing up our hands isn’t a viable option at this moment in history; neither is overworking ourselves and our hearts into the ground. Countries, like families, (and writing books), are journeys for the long-haul, though I too prefer the sprint. We can’t do everything. We won’t help everyone in all the ways needed. We will never be enough. But what is enough is our intention. Our vision. That we take some action on behalf of others. That we care for ourselves along the way. That we spend time simply being. At ease in ourselves and in our surroundings. Listening. Watching. Tuning in. Sourcing wisdom. Like everything else in life, this will look different for each one of us. Just the way we appear differently, love differently, pray & play differently too. And that’s the invitation. To find and hone and accept the responsibility of our own ways and strengths. I am so grateful to this administration and to the 45th President of the United States of America. I truly believe that he has helped form a more perfect union, awakening us to the privilege and devotion of citizenship, and joining us more intimately with those who struggle around the globe, aligning us more dearly with those with whom we share a vision for a safe and healthy and vibrant world. When the time is ripe, I look to his impeachment, preferably by a Congress of Women–representing both parties. Alas, what I hear inside is: “Not yet, not yet,” and sometimes I feel like I can’t bear it any longer. But we were made for times like these. Be strong. Be compassionate. Be your own friend.